In e-commerce, whether your business is trending up or down, you’re always being asked why. Which, whether you’re a web or digital marketing or customer experience professional, can be the most difficult question of all. “Why did 40% of our revenue come from customers in one region? Why aren’t we focusing on them?" These are important questions – questions that your success relies on. So it’s important to get the answers right, but that takes time – digging through dashboard and reports, consulting analysts, and testing theories. Time we don’t always have. Wouldn’t it be great if we had those answers at the ready? What would be even better – answering the questions before they even get asked. AI can understand and relate disparate data; learn from ingestion of data over time; and reason to form hypotheses based on that data. Which is great, but not something we need to dive into right now. When AI takes form for business (enter Watson), at its best the AI disappears into the tools and the user gets the benefit: in this case: actionable, near-real-time insight. If you use Watson Customer Experience Analytics or IBM Tealeaf on Cloud, you already have Watson on your team. And like your other team members (hopefully), he’s always working to get better. And now he learned a new skill: Anomaly Detection. How’s he do it? 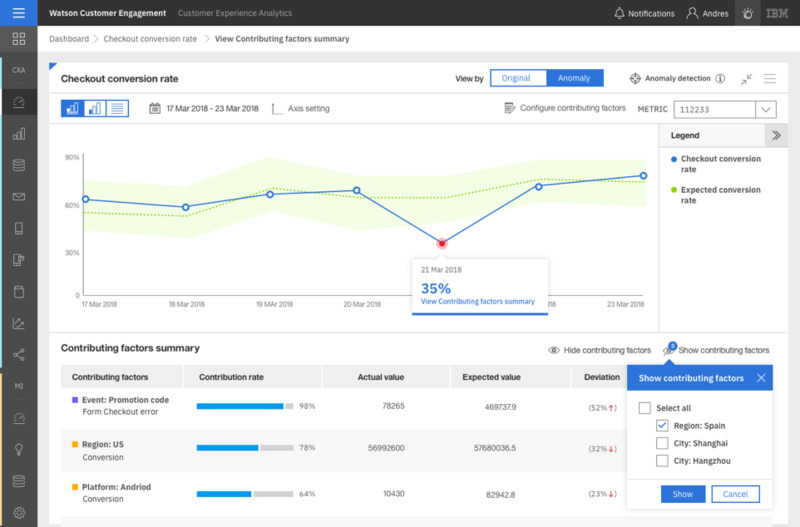 Watson continually combs your visitor behavior on your sites and apps across platforms for spikes or dips in your KPIs, like abandonment, conversion, cart value, or milestone progression. He knows what’s normal behavior and abnormal behavior, because he has learned what to expect of your digital business. So when something’s off, either good or bad, he tells you – right away. And the best part of all? He tells you why. AI Anomaly Detection alerts you to spikes and dips and the top five contributing factors. Maybe a certain geo is performing better than others, resulting in higher conversion in that location. Maybe a certain platform is loading pages slowly, causing abandonment. Maybe a site process is resulting in errors, and you’re getting bad feedback. With AI Anomaly Detection, you’ll know what is going on, when it is going on, and why. What will you do with this insight? If you see abandonment spike you’ll know the root cause - exactly what issues to look into and correct to get back on track. If you see performance spike you’ll likewise know the root cause – only in this case you’ll be able to amplify or replicate that success since you know what’s driving it. So don’t get caught without answers to questions about digital performance and CX. We’ve all been there, frantically consulting analysts and digging through reports to find out what happened. Better yet, don’t get questioned at all. With AI Anomaly Detection – you get alerted to abnormalities as they happen, so you’re the first to know. And you don’t have to go digging through reports for root cause – Watson gives you the top contributing factors right there with the alert. The possibilities are endless. The functionality will be here in late September 2018. Talk to your IBM representative, or request a consultation from our marketplace page today to learn more how Watson can help you know just what action to take, and when you need to take it to drive business results.